Please bear with me as I lead you through a bit of a necessary introduction to take you to the point of my final blog for 2010. 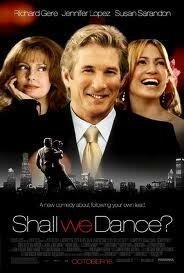 The 2004 American film Shall We Dance is a remake of a 1996 Japanese film of the same name. The 1996 garnered 91% on Rotten Tomatoes while the 2004 remake only received 46%. I haven't seen the original but must add that 46% shouldn't dissuade you from the remake. It is worth a rental on a Saturday night curled up on the couch with a bowl of popcorn. Starring Richard Gere, Susan Sarandon and Jennifer Lopez, the film is about the story of a lawyer who has a charming wife, a loving family and a good job but feels that something is missing. Each evening on his trek home on the train, he sees a woman staring through the window of a dance studio. One night, he impulsively jumps off the train and signs up for ballroom dance lessons in the strange hope of meeting her. The major part of the movie follows him through various lessons where he, for some inexplicable reason, becomes enamoured with ballroom dancing. No, he does not have some fling with the woman, Jennifer Lopez, but his growing enthusiasm for dance rekindles her own interest in her talent for the art. It is never really explained why, but Gere's character keeps the lessons secret from everybody including his wife, Susan Sarandon. She eventually becomes suspicious about his absences worried he is having an affair. She hires a private detective to find out what's going on but when she does learn the truth, she stops the investigation supposedly not wanting to invade her husband's privacy. The rest of the movie involves a dance competition; the time spent practising and the competition itself, etc. with some other plot twists. The important part of the film is the moment of confession between Gere and Sarandon about him keeping things secret, about wanting to find himself and not wanting to hurt his wife if he was unhappy. The climactic scene has him declaring his love for his wife. Okay, I should have given something of a spoiler alert but I don't think I will have told you too much to have ruined watching the film. I now arrive at the point of all this. There is a scene in the movie where Susan Sarandon meets the private detective in a bar who investigates her husband. Beverley: All these promises that we make and we break. Why is it, do you think, that people get married? Detective: Interesting because I would have taken you for a romantic. Why then? Beverley: Because we need a witness to our lives. There's a billion people on the planet. I mean what does any one life really mean? But in a marriage, you're promising to care about everything: the good things, the bad things, the terrible things, the mundane things. All of it, all the time, everyday. You're saying your life will not go unnoticed because I will notice it. Your life will not go unwitnessed because I will be your witness. Who will bear witness to us? Who will bear witness to our lives? What does any one of our lives mean? There are not a billion but close to seven billion people on this planet and yes, we will all go unnoticed for the most part. However "for the most part" is not "all parts"; it is not everything. Hopefully there is still someone who will notice. The cast is warmly appealing, but with the loss of cultural context and addition of big-name celebrities, this American version loses the nuances of the original. Shall We Dance? is a 2004 American film that is a remake of the award-winning 1996 Japanese film of the same title, written and directed by Masayuki Suo. Shall We Dance? (Shall we ダンス? Sharu wi Dansu??) is a 1996 Japanese film. Its title refers to the song, "Shall We Dance?" which comes from Rodgers and Hammerstein's The King and I. That is a very interesting perspective on marriage. Thank you for sharing. The desire to have someone witness our lives and to witness someone else' life is a very romantic one.